Significant nitrogen removal can also occur in SBRAS systems.' ' '' The performance of SBRAS systems and their analogy to continuous flow activated sludge systems, particularly the MLE process, is discussed in Section 7.8. The design and operation of SBRAS systems is discussed in Chapter 10. Many operating SBRAS facilities use an anoxic till period or anoxic/aerobic cycling as an anoxic selector to control the growth of filamentous bacteria, also resulting in a significant degree of nitrogen removal. SFAS processes can also be configured to accomplish biological nitrogen removal by providing an anoxic zone at some or all of the step-feed addition points/ ,VM Significant nitrogen removal can be accomplished with this approach. Significant denitrilication is observed in some nitrifying activated sludge systems even though separate anoxic zones are not purposefully provided. Two circumstances are necessary for this to occur: (l) an operating SRT significantly greater than that required to achieve nitrification, and (2) regions of low DO concentration which allow denitrification to occur. If the SRT is considerably greater than that required for nitrification, the low DO regions can exist within the aerated bioreactor without negatively impacting its ability to nitrify. Low DO concentrations can occur in specific regions as a result of the bioreactor and aerator configurations, or they can occur inside the activated sludge Hoc particles throughout the bioreactor. The requirement to transport oxygen into the floe by diffusion will result in a DO concentration gradient within the Hoc. This gradient can produce anoxic zones inside the floe which can contribute to denitrification. 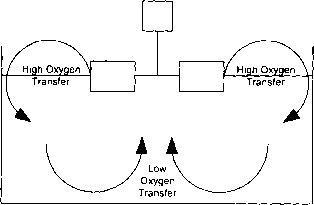 Figure 11.6 Variation in oxygen transfer rate in a biological reactor with a point source aerator. complete denitrification, ranging up to 70 to 90%, has been observed in oxidation ditch activated sludge systems,'"1 which incorporate the features of point source aeration and MLR on an even larger scale (sec Figure 10.4). Poor mixing in the bioreactor can also encourage denitrification by creating low DO zones. Finally, the aeration input to continuous flow systems has also been cycled to create periods of high and low DO to encourage denitrification, as discussed in Section 6.5.2. While experience indicates significant denitrification potential for all of the above approaches, procedures to predict performance are, at best, approximate, and direct experience is the best guide to process design and operation. It is important to recognize, however, that operation with undefined anoxic zones may lead to growth of the filamentous bacteria classified in Table 10.5 as Group IV—aerobic, anoxic, and anaerobic zone growers. ""1 Consequently, achieving nitrogen removal by encouraging denitrification in aerated basins may result in poorer sludge settleability. 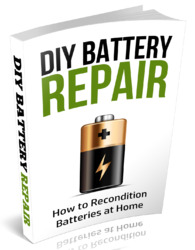 More work is needed on this subject to clarify the design and operational trade-offs. Each of the systems previously considered in this section was developed to allow use of the biodegradable substrate in the wastewater as the electron donor for denitrification. In some cases, however, it may be necessary to denitrify the effluent from a nitrifying activated sludge system, which will be very low in organic matter. Such a stream can be readily denitrified in a separate stage suspended growth denitrification systemI1w",i,M if a supplemental electron donor, such as methanol, is added, as illustrated in Figure 11.7. The electron donor is added in proportion to the nitrate-N content of the influent as it enters the anoxic zone, as discussed in Section 6.4. An aerobic zone is required to strip the entrained nitrogen gas and to prepare the biomass to settle in the clarifier. It will also allow metabolism of any excess electron donor that was not removed in the anoxic zone, thereby maintaining a high effluent quality. The SRT for such systems is typically between 3 and 5 days. Because of the low yields typically observed with substrates like methanol, the bioreactor HRT can be in the 2 to 4 hr range while maintaining typical MLSS concentrations. The aerobic HRT will typically be 45 to 60 min. 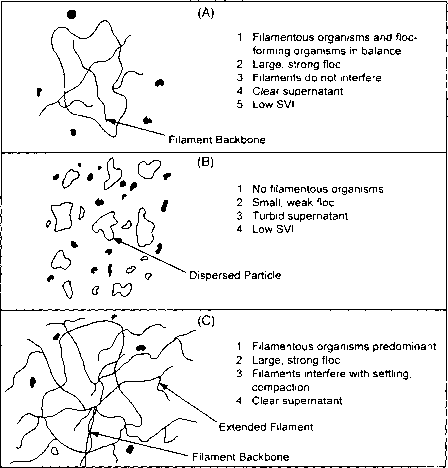 Biological Phosphorus Removal Processes. Biological phosphorus removal processes utilize an anaerobic zone coupled with an aerobic zone to select for PAOs. Two systems will be considered: the A/O™ or Phoredox process, and the Phostrip® process. Figure 11.8 provides a process schematic for the A/O™ process,14 4" which is discussed in detail in Section 7.7. The term A/O™ stands for anaerobic/oxic (oxic = aerobic) and represents the sequence of environments provided in the bio-reactor. The A/O™ process is referred to as a mainstream BPR process because the anaerobic zone is contained in the main process stream. Optimum phosphorus removal is obtained by high-rate operation, corresponding to an SRT in the 3 to 5 day range, with an anaerobic SRT of about 25 to 30% of the total. For typical MLSS concentrations, the resulting bioreactor HRT is often in the 3 to 6 hr range. Highrate operation maximizes phosphorus removal by minimizing nitrification and maximizing solids production. High solids production is desirable because it maximizes the wasting of high phosphorus content biomass. As indicated in Figure 9.2, aerobic SRT values as low as 2 to 3 days are required to prevent nitrification from occurring at temperatures of 20°C or above. Figure 11.9 provides a simplified schematic diagram for the Phostrip® process." " It consists of a conventional activated sludge system that passes approximately 30 to 40% of the return activated sludge (RAS) flow through a stripper tank. The stripper is similar in configuration to a gravity thickener and maintains the MLSS in the RAS under anaerobic conditions in a sludge blanket, with a residence time of 8 to 12 hr. The stripper is the anaerobic zone where phosphorus release occurs, while the aerobic zone is provided by the main bioreactor where phosphorus uptake occurs. Since the anaerobic zone is provided in a sidestream bioreactor, the Phostrip® process is referred to as a side-stream process. 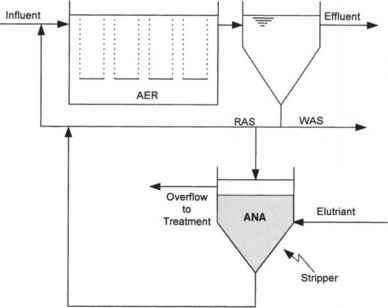 In addition to a portion of the RAS, an external elutriant stream, such as a small portion of the influent wastewater or treated effluent, is added to the stripper to remove the released phosphorus. The loading of biodegradable organic matter on the stripper is relatively low. One source is particulate organic matter entrapped in the MLSS added to the stripper. The particulate matter can be solubilized and then fermented into VFAs in the stripper, thereby providing a VFA source for the PAOs. Another source is the organic matter contained in the elutriation stream. Indeed, experience indicates that process performance is enhanced when wastewater is used as the elutriant rather than treated effluent. The stripper overflow, which is enriched in phosphorus, is typically treated with lime to precipitate the phosphorus. Consequently, two phosphorus removal mechanisms operate in the Phostrip® process: through the WAS, due to the enriched phosphorus content of the MLSS, and in the stripper overflow. Processes that Remove both Nitrogen and Phosphorus. Processes that remove both nitrogen and phosphorus incorporate anaerobic, anoxic, and aerobic zones along with MLR. Since nitrification occurs in these systems, the RAS will contain nitrateN, which will adversely impact phosphorus removal if it is added directly to the anaerobic zone. Consequently, control of nitrate-N addition to the anaerobic zone is a key consideration in the selection and design of these processes. Figure 11.10 provides a process schematic of the A /O™ process.The term AVO™ stands for anaerobic/anoxic/oxic and, just as for the A/O™ process, represents the sequence of environments provided in the bioreactor. It may be thought of as a combination of the MLE process for nitrogen removal and the A/0'M process for phosphorus removal. Consequently, the SRT in the anaerobic zone is similar to that used in the A/O™ process (0.75 to 1.5 days), and the SRTs in the anoxic and aerobic zones are similar to those used in the MLE process. The HRTs are also correspondingly similar, since the MLSS concentrations are in the same range. Mixed liquor recirculation rates of one to two times the influent flow rate are often used. The nitrogen removal capability of the A /O" process is similar to that of the MLE process, but the phosphorus removal capability is usually less than that of the A./O™ process due to the recycle of nitrate-N to the anaerobic zone. Although the recirculation of mixed liquor to the anoxic zone results in substantial removal of nitrate-N, complete removal is not possible (just as it is not possible in the MLE process) and some nitrate-N is present in the RAS directed to the anaerobic zone. The impact of that nitrate-N depends on the organic content of the wastewater. If it is high relative to amount needed for both phosphorus and nitrogen removal, the nitrate-N recycle will not adversely impact effluent quality. On the other hand, if it is low. process performance will be adversely impacted. Maintenance of a solids blanket in the claritier to allow denitrification of the RAS has been used with the AVO™ process to reduce nitrate-N recycle. However, it requires careful claritier operation to prevent clumping and floating sludge. Another process for combined nitrogen and phosphorus removal is the five-stage Bardenpho1" process illustrated in Figure 11.1. It may be viewed as a four-stage Bardenpho nitrogen removal process with an anaerobic zone added to achieve phosphorus removal. Nitrate-N recycle is controlled because of the extensive nitrogen removal obtained in the bioreactor. The overall process SRTs and HRTs in the anoxic and aerobic zones are similar to the corresponding SRTs and HRTs in the four-stage process, as are the MLR rates. The HRT in the anaerobic zone is typically 0.75 to 1.5 hr, making the SRT in the range of 0.75 to 1.5 days.